Old Gateway, Rievaux Abbey in Helmsley, Yorkshire. 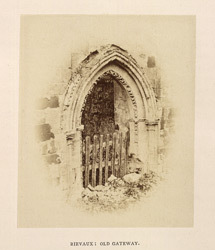 bl.uk > Online Gallery Home	> Online exhibitions	> Early photographically illustrated books	> Old Gateway, Rievaux Abbey in Helmsley, Yorkshire. Excerpt from “Rievaux Abbey”, in ‘Ruined Abbeys and Castles of Great Britain’ by William and Mary Howitt.